Did you know there were 434,000 workplace injuries reported by US manufacturers in 2013? According to the Bureau of Labor Statistics, over 70,000 injuries occurred in the Fabricated Metal Products Industry. The good news is that the rate of manufacturing-related injuries in continues to decline even as the US brings more and more manufacturing jobs back from overseas. You can help continue that trend in 2015 by regularly discussing safety at your shop. The MMI Auction Blog will be supporting machine shop safety initiatives in 2015 with checklists, shop safety best practices, and other resources. 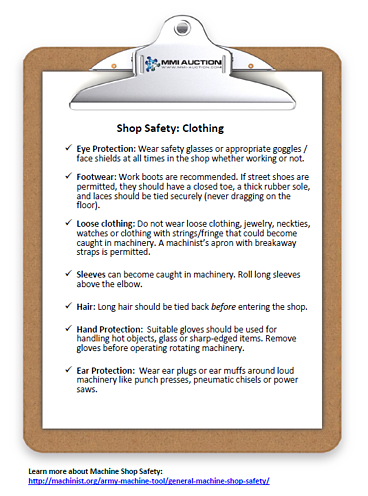 Today, we get started with a printable Safety Checklist for Clothing. Click the image below to download or print, and scroll to the bottom of this post for additional resources for starting or continuing your safety program. Check back for more safety tools each month! OSHA has a Small Business page with numerous easy-to-follow health and safety resources, including a Health and Safety Handbook with extensive safety checklists. All materials are available in English and Spanish. For resources specific to Machine Shops, check out the General Shop Safety page at Machinist.org.